Anita Hellam admits she’s never had to live on the streets, nor has she ever been a paycheck away from homelessness. But as the executive director of Habitat for Humanity for Stanislaus County since 2002, Hellam has dedicated her professional life to assisting those on the streets. 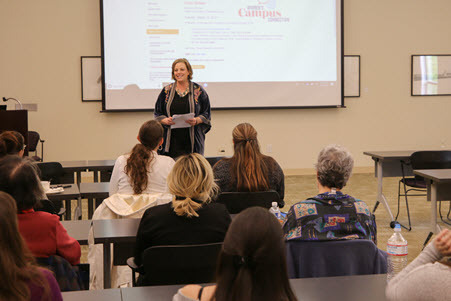 On Tuesday, March 12, as the guest speaker for this semester’s Women’s Campus Connection event, she spoke of how helping the homeless helps everyone, and how changing community attitudes toward the homeless may be her most important task. Over the past 20 years, Hellam has played various roles in the building of more than 300 affordable housing units and remodeling of more than 400 houses in the Central Valley. Nationwide, she said, Habitat for Humanity builds or refurbishes more than 300,000 homes annually. She told the story of a very nice couple who lived down the street from where Habitat for Humanity was building an affordable home. She had a pleasant conversation with them and they seemed to be decent folks, but they firmly believed the construction of that affordable house was bad for their neighborhood. That’s one side of attitudes toward affordable housing that need to be adjusted for there to be real success helping the homeless, Hellam explained. But, she said, there is another side to the need for adjusted attitudes: The homeless have to be willing to accept help. Sometimes, it comes down to making the homeless person feel wanted, loved and that they are a person of value. Women have the power to make remarkable changes within their communities, she said, and Habitat for Humanity is one of those vehicles for great change. “We’re proud of the work we do and the contributions we make and it’s great to be involved in a cause greater than ourselves,” Hellam said.